AVX tie-in! Captain America has called the New Avengers to war against the X-Men, and Luke Cage will be forced to make a big decision: stand with his wife and child? Or suit up alongside the Avengers? Then, Iron Fist discovers the shocking secret history of the Phoenix in K'un-Lun's Book of the Iron Fist! Hope Summers journeys to Iron Fist's magical home to uncover her destiny. But will she conquer her future - or be consumed by it? Plus: The X-Men take three of the Avengers' mightiest captive, but no jail can hold them for long. Or can it? 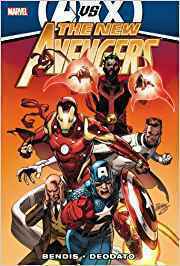 And with the Avengers/X-Men war raging at a fevered pitch, Captain America calls out the big guns against the X-Men and the Phoenix Five: Can the Illuminati succeed where the Avengers failed? Collecting NEW AVENGERS (2010) #24-30.